Are Citizens of the World Succeeding in Lessening Global Poverty? Poverty is a global phenomenon. There are two types of poverty: absolute and relative. Absolute poverty is deprivation of basic needs while relative poverty is inability to fulfil wants. An absolutely poor individual has no essential food items for healthy intake, needed shelter for proper living, potable water for clean drinking, disposal arrangements for right sanitation, required transportation for easy travel, medication facilities for necessary fitness and appropriate institutions for education, rudimentary or advanced. A relatively poor individual "lacks the minimum amount of income needed in order to maintain the average standard of living in the society." Briefly speaking, poor can't satisfy their fundamental needs and are unable to acquire the basic accessories of life. Let us discuss a few key concepts to get our mind around poverty: poverty line, poverty trap, abject poverty and vicious circle of poverty. 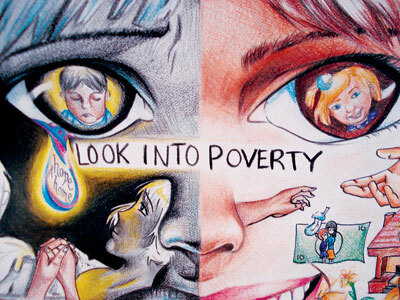 Poverty line is used to earmark poverty level of an economy. It defines the official level of income that is necessary to be able to afford the basic human needs. Poverty line determines which populations are considered to be in absolute poverty. More than 1.3 billion people live in extreme poverty; they get less than $1.25 a day, and nearly half the world - over 3 billion people - lives on less than $2.50 a day. Poverty trap, however, is "a situation in which a person stays poor even when he/she gets a job or support because the money one receives is insufficient." It is a condition which makes it very difficult for people to escape poverty, independently. It is argued that poor individuals/families must be given sufficient aid so they can acquire the required capital/capability to raise themselves out of poverty trap. Abject poverty is suffering from extreme or absolute poverty. The vicious circle of poverty is "the set of factors or events by which poverty, once started, is likely to continue unless there is outside intervention." The conventional methods to eliminate poverty suggests taking action at four different levels. First, a country's government may support non-profit organizations and help its own people directly. Second, at bilateral level, countries may cooperate with one another to find a solution for this problem. Third, countries in a regional block may take measures against poverty (e.g. members of SAARC can take a proactive part in reducing poverty among fellow member countries). Fourth, international community and native governments may unite in order to abolish global poverty throughout the world by prosperity sharing. There are multiples causes of poverty. We can, for our convenience, sort them under social, political and economic stimuli. First and the main cause is illiteracy, the lack of ability to read and write. Almost every 1 in 5 people around the world are illiterate - 2/3 of them are women. Illiteracy is a social issue; a social entrepreneur/reformer can manage it effectively. It is noteworthy; awareness is the foundation of any struggle against poverty. Citizens' thoughts should be inclined towards prosperity development and financial well-being to make sure individuals are geared up for poverty take-down. Inequality of wealth is a major politico-economic reason for poverty. On account of capitalism, oligopoly, corruption, bad governance and multiple other factors that contribute to continuous impediment and oppression towards common masses, the emergence of inequality of wealth is ineluctable. Inequality stirs violence among the public; violence impedes business activities and low business activity augments poverty. Trade is engine of growth, an important business activity. It diminishes poverty of involved (exporting and importing) countries. But there are multiple tariff barriers which surge hindrances during trade; hence easy trade is very helpful for smooth transactions. It is noteworthy, importers and exporters are entrepreneurs and they need less or no trade blocks for better working of their businesses. In order to reduce poverty through trading activities, governments should reduce trade taxes and other non-tariff barriers. An economic reason for poverty is low business activity. It is surfaced on account of exigent rules and regulations, e.g., in Canada, it takes two days, two registration procedures, and $280 to open a business, while an entrepreneur in Bolivia has to pay $2,696 fee, wait 82 business days, and go through 20 procedures to do the same. Such costly barriers favor large firms at the expense of small and medium-sized enterprises (SMEs), where most jobs are materialized. Entrepreneurship is an important and scarce segment of every society. Entrepreneurs give boost to various economic activities. Generally, they lack capital and are unable to operate their start-ups, effectively, or fail to introduce their ideas to the market, for that matter. Government or rich citizens may finance these entrepreneurs. Consequently, poverty will reduce on account of employment generation and healthy business activity. Governments and organizations may initiate assisting young and prospective entrepreneurs by investing resources to their start-ups through good loans. Normally, investments are reimbursed, with or without profit/interest. Good loan is an innovative mode of investment where resources lent are repaid, more or equal to the amount loaned, when the business starts functioning smoothly and pardoned if it fails during the early stages. This will increase sustainability of the businesses, entrepreneurs, and investors which will eventually set in motion the struggle against poverty elimination. Education is highly important in lessening global poverty. Governments should take wholehearted measures to create fruitful educational environment in their countries. They can start off by; first, granting students scholarships and supportive educational environment; second, giving youth advance technological facilities/gadgets for empowerment; third, providing proper entrepreneurial training to students for right future planning. Students with innovative business or welfare ideas can be separated out for guidance for initiating their ventures, proficiently. It is responsibility of the government to aid students who are facing financial problems during education. Citizens may contribute to the struggle against poverty privately as well. They may support their relatives at their time of need, give charity to poor/destitute people or invest resources to non-profit organizations. Moreover, they may finance or offer good loans to potential entrepreneurs. Muhammad Yunus, a social reformer, banker and economist, born on 28th June 1940 in the village of Bathua, pioneered a project named "Grameen Bank" in 1983 in Bangladesh to fight poverty. He provided credits to poor for income generating activities and financing entrepreneurs. It was a very helpful, innovative idea for poverty extermination. Grameen methods are now applied in projects in 58 different countries. Muhammad Yunus also got a Noble Prize for his efforts. Jacqueline Novogratz, an American entrepreneur and author, founded Acumen in 2001, a non-profit global venture capital fund whose goal is to use entrepreneurial approaches to address global poverty. She and the organization envision a world based on dignity, where every human being has the same opportunity. Their vision further writes, "rather than giving philanthropy away, we invest it in companies and change-makers." Global Poverty is a social, economic, and political issue. Promotion of entrepreneurship among members of a society through effective financing and training may eradicate global poverty on account of self-assertion and healthy business activity, once and for all. "They say that right before you die, your life flashes before your eyes. Make it worth watching."